No shirt. No pants. No shoes. No problem with the ladies. No problem rockin'. Nobunny loves you. 1. Just saw the fine gentleman above who calls himself Nobunny perform live at the Conservatory here in Oklahoma City just a couple weeks back. He wore slightly more than in the picture above, wore that trademark, worn-down bunny mask and proceeded to rock us all more in the maybe forty minutes he and his fine band performed than most bands can do in the standard hour and a half. If you can get past the weird get-up, it's just some of the finest elemental, raw rock 'n' roll out there right now. Having said that, don't try to get past the weird get-up. It makes the really good garage-y lo-fi rawk you're enjoying that much more fun. 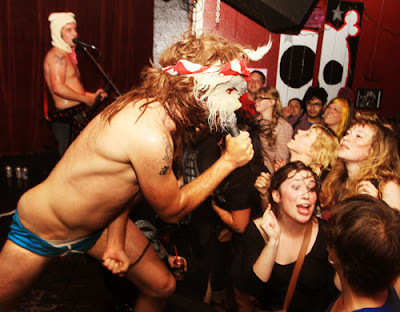 And no one has more fun during a rock show than Nobunny--except maybe those witnessing his bizarre greatness. Start with: Nobunny's full-length LP, Love Visions--especially "Mess Me Up" and "Chuck Berry Holiday"
3. Finally broke down and caved in to the pod people who waited me out until I finally fell asleep and joined the rest of you. I said a heartfelt goodbye to my beloved Zune (who has found a new home with a much deserving friend) and bought an iPod. I was finally seduced by the ease of finding accessories, increased space, reduced size, and all that cool Genius playlist making capability. The real Rob is dead. iPod Rob is alive and accepting of his fate. 4. I'm taking the plunge and going to Lollapalooza in Chicago this summer! No seriously, this time I mean it. I bought festival tickets, plane tickets, etc. Okay, so I did that last time, too but I really mean it this time. And that lineup! Jealousy starts in 3, 2, 1...go! That's all for now, Kids. Birthday is Saturday which means a birthday playlist that you just won't believe even though it'll be staring right in to your looking balls...Love you so and so. Happy Birthday- the band, they're playing August 3rd, right here in our fair city!